Libraries | Malik The Magic Guy! Top New England Comedy Magician Boston Massachusetts and New England Magician Malik the Magic Guy. Malik has performed at dozens of libraries in Massachusetts and Rhode Island. In 2013, Malik was the featured magician for the 2013 Rhode Island Summer Reading program, performing over 30 shows in Rhode Island alone. The shows are written each year to incorporate the national Summer Reading theme. Now Booking for the 2016 "On your Mark, Get Set, Read!" program. Exciting things are in store for the 2016 show. 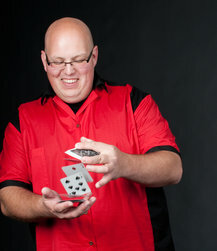 Magic with sports equipment, demonstrations of activities and games from other cultures, and more fun surprises.